At this time of year large numbers waders, wildfowl, ducks and geese are returning from their breeding grounds so that they can spend the winter resting and feeding on our coast. 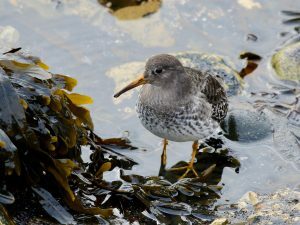 Some of these bird species, such as greylag goose, sanderling, purple sandpiper, redshank and dunlin, are here in internationally significant numbers. It is important to remember that coastal birds use up a lot of energy during these cold, short, winter days and so are particularly sensitive to disturbance. Having to move or fly off to avoid people or dogs can use up valuable energy reserves and reduce the short time available for them to feed. It may take them many hours to make up the energy lost, which ultimately lowers their chances of surviving through to their summer migration.